Emily Post is probably frowning at me (tastefully, unobtrusively) from the great beyond for mentioning a holiday pie before Halloween is even over, but trust me: this one is worth the breach in etiquette. The backstory? Not long ago, I sampled an absolutely delicious walnut-caramel-cranberry bar cookie in Chicago, and instantly I knew I had found a hit: the sweetness of the sugary nut mixture was perfectly paired by the tart cranberries. I had a feeling that it would translate beautifully to Pecan Pie. So when I encountered the Bourbon Pecan Pie in the brand new (and so worth buying!) Grand Central Baking Book by local legend Grand Central Bakery (remember my adventure with early morning baking there? ), I knew I had found the ideal recipe for my cranberry hypothesis. Well, this spy is happy to report that it worked beautifully. Adding a generous handful of tart cranberries (I know! Fruit!) 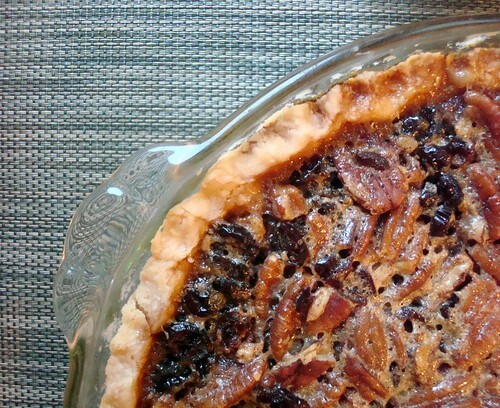 to the Bourbon Pecan Pie worked on two levels: first, it tempered the extreme sweetness of the pecan-sugar-corn syrup mixture; second, it added a refreshing tang to the fiery, warming bourbon. Want some for yourself? Here's the recipe. Prepare the pie crust. Put the flour, salt and sugar into a food processor and pulse once or twice. Add the butter and process until the mixture looks grainy. Then slowly, while pulsing, add the water until you can form the dough by pressing it between your fingers. Note: this can be done by hand as well. Decant the loose dough onto a piece of plastic wrap. Using the wrap, fold the loose dough towards the middle and press with the back of your hands to form dough. Wrap and chill for at least 4 hours before using. Dough can be made ahead for up to one week. Before you're ready to bake this pie, blind-bake the pie crust for about 10-15 minutes at 325 degrees F.
Ready to make the pie? Preheat your oven to 325 degrees F., baby! When you're ready to Prepare the filling. Put the corn syrup and brown sugar in a heavy saucepan over medium heat and cook, stirring occasionally, until the sugar dissolves. Remove from heat and add the butter, bourbon and vanilla. Let the mixture cool, and then add the eggs and whisk until smooth (don't add the eggs while the mixture is still very hot, otherwise you'll have scrambled eggs!). Fill and bake the pie. 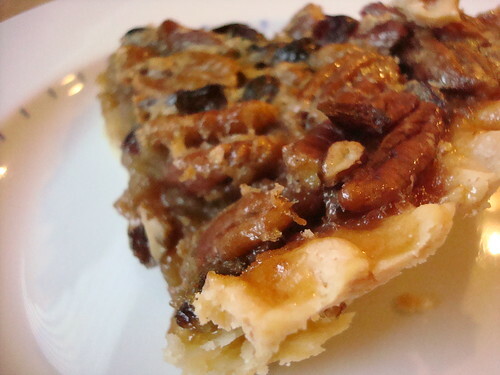 Arrange the pecans and cranberries on the bottom of the crust. Carefully pour the filling over them (some will rise to the top, like magic!). Bake for 45-50 minutes, until the filling is set; rotate the pan halfway through baking time. This pie allegedly serves about 8--however, what the recipe does not mention is that the 8 servings may be the same 2 people four times in one day.